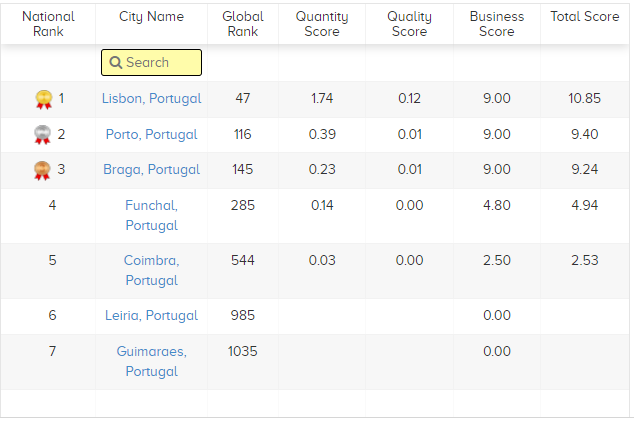 According to a tweet by StartupBlink, Portugal is likely to rise in the rankings "because of a supportive environment." "StartUP Portugal is [the] Portuguese government's strategy for encouraging entrepreneurship focusing on developing the current startup ecosystem, funding opportunities and internationalization. Through this, startups can also avail financial backing as an alternative to bank loans. Apart from this, there are around 20 more measures underway due to this program, like Startup Voucher where there is support during ideation phase." Less than a week after launching applications for this year's Portugal StartUP Voucher, IAPMEI announced it had received more than 200 requests for information and 120 registrations on the platform. According to StartupBlink, Startup Lisboa is another leader working with the government to boost Portugal's startup ecosystem. "Startup Lisboa is an incubator located in the city. A recent startup success story at Lisbon was when Web Summit, an annual global tech conference, was moved from Dublin to Lisbon since 2016. This was because of the buzzing startup scene in the city and better infrastructure." In August, Startup Lisboa, together with Turismo de Portugal, opened applications to the From Start-to-Table accelerator to accelerate innovation in the restaurant ecosystem. After reviewing 113 projects, Portugal's €30,000 GovTech contest for solving the problems of humanity selected its six finalists after voting on the blockchain. Responses to Portugal's GovTech blockchain contest were so positive that the government wants to launch a second edition.